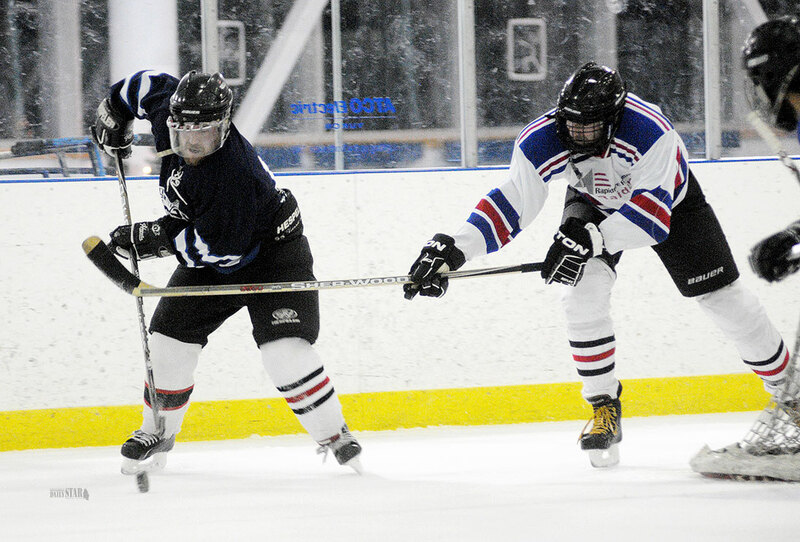 NEW HOCKEY SCENE – Sun Life Sundogs centre Riley Gibson, left, and Rapid Fire Raiders centre Dan Putland battle for puck possession in a recent Canyon City Hockey League game. The gentlemen’s hockey league was founded this year in Whitehorse. The small town of Whitehorse once again made a big impression in sporting circles this past year. Yukoners returned to the Winter Olympics and Scotties Tournament of Hearts after long hiatuses, the territory sent a team to the Arctic Winter Games, and the city hosted another world junior softball championship. The following is a summary of local sports highlights in 2014’s year in review. 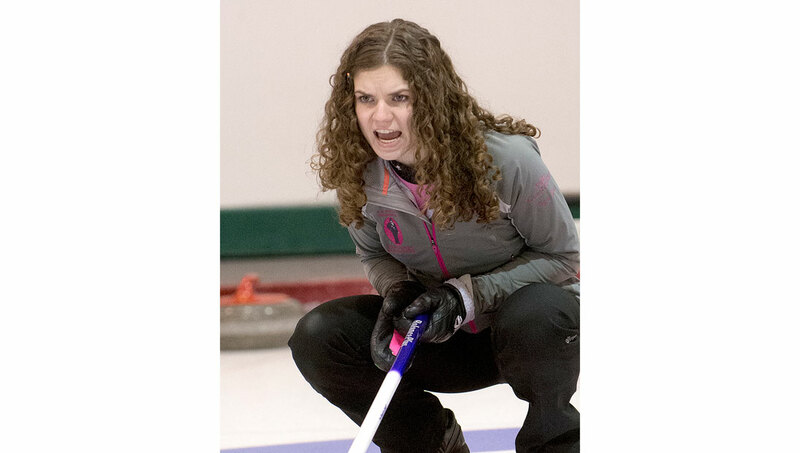 Young curling skip Sarah Koltun claimed the first major sports headline of 2014, edging star Yellowknife skip Kerry Galusha in the northern Scotties playdowns. Koltun’s rink would go on to participate in its eighth junior nationals, finishing 10th in Liverpool, N.S. On Jan. 14, cross-country skier Emily Nishikawa became the first Yukoner in 22 years to make a Winter Olympics roster. She was one of five women named to Canada’s 11-member squad. Team Koltun became the youngest rink in history to compete at the Scotties Tournament of Hearts in Montreal, securing two wins. 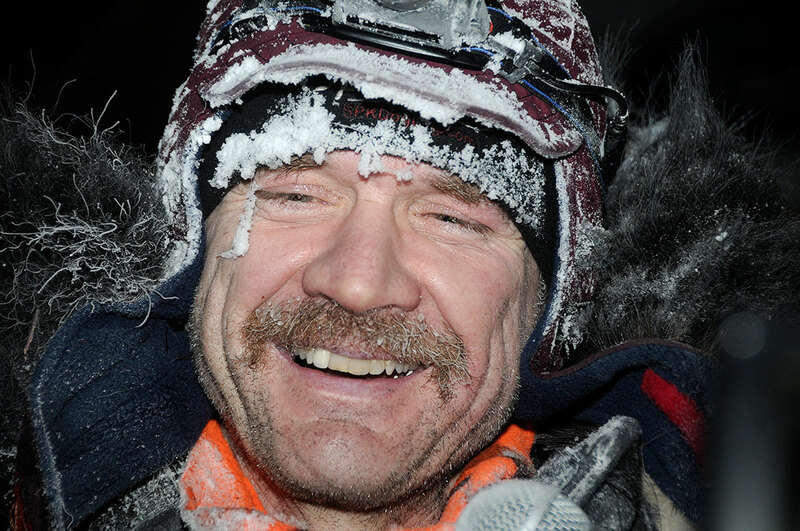 Alaska musher Allen Moore won his second straight Yukon Quest sled dog race. The 56-year-old broke his own record for fastest finishing time on a shortened Quest trail, crossing the line in eight days, 14 hours and 21 minutes to take home $22,700. Rival musher Brent Sass was neck-and-neck with Moore before Braeburn, when he suffered a concussion in a fall and scratched from the race. 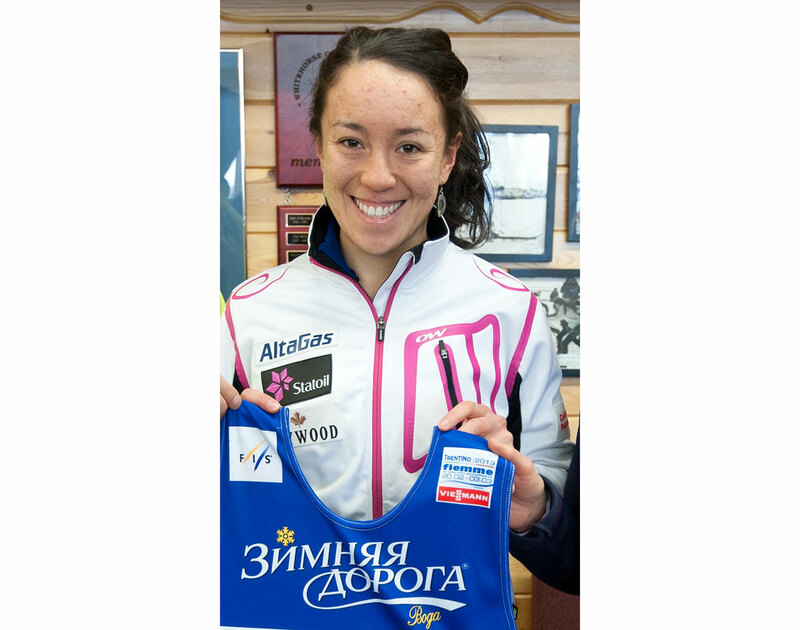 Nishikawa represented Whitehorse at the Olympics in Sochi, Russia, where she competed in three races. She led the Canadian contingent in two of her three races, but missed her best event – the 10-kilometre classic – due to sickness. Graham Nishikawa would follow his sister’s ski tracks to Sochi, where he served as a guide for blind skier Brian McKeever. Nishikawa went on to lead McKeever to three gold medals. Freestyle skier Etienne Geoffroy earned a pair of gold medals at the Canadian Junior Freestyle Championships in Le Relais, Que. Team Yukon’s contingent of 260 athletes took home 85 ulus from the Arctic Winter Games in Fairbanks, Alaska. The final standings gave the territory 22 gold, 25 silver and 38 bronze medals. The Yukon cross-country ski team put together the territory’s finest showing at the national championships in Newfoundland, winning a best-ever 19 medals to finish second out of nearly 60 clubs in overall aggregate standings, matching its previous best results from 2012 and 2007. Haines Junction native Reid Campbell cemented his place in NCAA hockey history, winning his third national championship in a four-year span with St. Norbert College. On March 30, the EGT Nanooks beat the Nannock Warriors 4-3 to win the A Division final of the 37th annual Kilrich/Northerm Yukon Native Hockey Tournament, in which 40 teams participated. The Yukon government earmarked $250,000 in their budget for an outdoor sport complex featuring soccer fields and an eight-lane rubberized track in Whitehorse. The Yukon Coates Lead Dawgs claimed fifth in the mixed division of the Canadian Senior Broomball Championship held in Calgary. Whitehorse resident Aline Goncalves and her curling partner Marcelo Mello led Brazil to its first-ever victory at a curling world championship in Dumfries, Scotland. Clara Hughes, a decorated Olympic speedskater and cyclist, entered Whitehorse on Day 60 of her Big Ride, an initiative meant to engage communities and youth across Canada in conversations about mental health. Four Yukon judokas – Amy Roberts, Jerry Miller, Jacob Melanson and Shayne Melanson – helped the territory make a proud return to the national judo championships in Saguenay, Que. A Dustball dynasty fell when the P&M Recycling Guns – a Yukon team seeking its fifth straight title – dropped the A final to their Alaskan rivals, Chico’s Bail Bonds, 24-20 in an extra inning. Jonah Clark, owner of Whitehorse’s Icycle Sport bike shop, won the 240-km Kluane Chilkat International Bike Relay by just four seconds, beating out fellow Yukoner Derek Crowe for the honour. The win marked Clark’s third as a solo rider. Wheelchair racer Jessica Frotten won two gold medals at the Canadian Track and Field Championships in Moncton in late June, and added a silver for good measure. Shaun Thrower and Steve King led the 2014 Yukon River Quest from start to finish en route to winning the 16th annual race. The British kayak duo – known as ‘Two Numbnuts’ – reached the Dawson City finish line in 45 hours, 30 minutes and 32 seconds. Retired NHLer Theoren Fleury gave a motivational talk in Whitehorse, recounting his struggles with alcohol and drugs during his career following sexual abuse he suffered as a junior hockey player. Team Yukon collected 14 medals at the Special Olympic Summer Games in Vancouver. The territory’s soccer club won gold in a thrilling C division final, with Michael Sumner providing the clinching goal in penalty kicks. Argentina won their second straight junior men’s world softball title, beating New Zealand 9-0 in Whitehorse. Canada finished in seventh place, ahead of just the Czech Republic, Denmark and Singapore. Team Yukon returned home from the North American Indigenous Games sporting 11 new medals. The 45-athlete contingent finished 12th out of 20 teams with four gold, three silver and three bronze medal wins in Regina. Yukon wrestler Brittanee Laverdure won a silver medal at the Commonwealth Games in the 55-kilogram freestyle event. New Zealand paddlers Ian Huntsman and Wendy Riach earned victory in the Yukon 1,000, completing the world’s longest paddling race in just over six days. Logan Roots won his second Yukon River Trail Marathon, posting the quickest time of 315 participants. All three Yukon paddlers at the national whitewater championships in Barry’s Bay, Ont., earned gold medals. Mael Pronovost and Luanda Pronovost did it in kayaking, while Pelly Vincent-Braun went on to crack the junior national slalom team roster. Team Yukon returned home from the Canada 55+ Games in Strathcona County with a whopping 64.5 medals. The territory picked up 24 gold, 22.5 silver – the half medal coming via a tie – and 18 bronze and also earned the Spirit of the Games award. One of the most highly-anticipated battles in Klondike Trail of ’98 Road Relay history finally played out on the big stage with Anchorage’s Team Raven: Take No Prisoners beating Whitehorse’s Scarecrow to the finish line by more than 10 minutes. Watson Lake wrestler Laverdure finished the Senior World Championships in Tashkent, Uzbekistan, ranked 12th in the world. Yukon cyclist Zach Bell entered his off-season in style, winning the Thompson Bucks County Classic road race with a 20-km solo breakaway. For the first time in three decades, a Yukon athlete made the Team Canada roster for the Special Olympics World Summer Games. Long distance runner Darby McIntyre will compete in Los Angeles next July. Whitehorse’s only bowling alley – Mad Trapper Alleys – announced it will close in the spring. Cross Country Canada announced the 2016 Haywood Ski Nationals will return to the Yukon capital in 2016. The community last hosted the nationals in 2010 with more than 420 North American skiers participating. Longtime hockey coach and member of the Sport Yukon Hall of Fame Jim Fowler drowned after skating into open water on Marsh Lake. He was 73. Two longtime leaders of Whitehorse’s ElderActive Recreation Association were elected to the Yukon Sports Hall of Fame in the builder category. William “Bill” Simpson and his wife, Diana, were honoured posthumously. Fifteen-year-old figure skater Rachel Pettitt twirled her way to a silver medal in the novice women category at Skate Canada Challenge in Montreal. The Whitehorse Huskies – hoping to make a Coy Cup run in 2015 – kicked off their comeback season in style, winning two straight games over the Fort Nelson Yeti. The Whitehorse Women’s Hockey Association made national headlines after drafting a policy allowing transgendered players to play in its league.